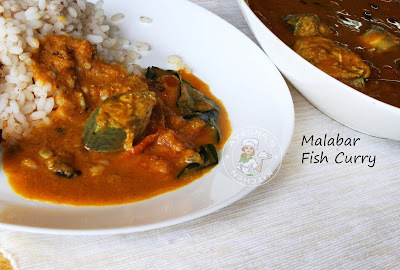 Here is a fish curry recipe from Gods own country, Kerala. Fish curry or fish gravy accompanied with hot steamed rice is one of my favorite lunch meals and of course for many of us. 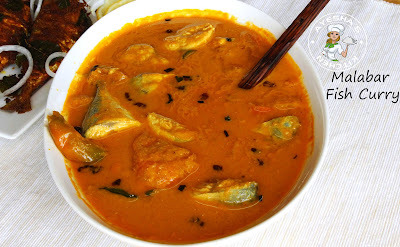 My family loves curry fish with coconut than without coconut recipe. So, I often make this fish recipe which is the traditional Malabar recipe. 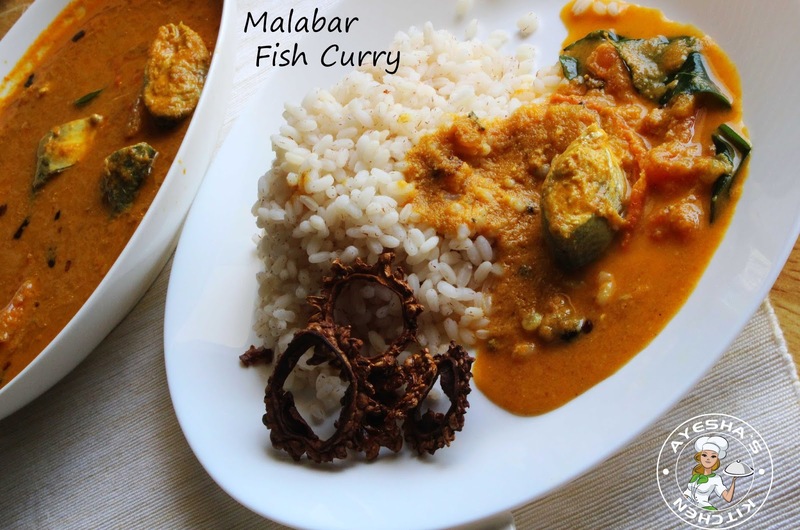 This dish will surely take you back to the aromatic and flavorful journey of Kerala cuisine / Malabar cuisine. Each Indian fish recipes are quite different in taste and way of preparation. Moreover, each variety of fish which is available in the market has its own unique flavor and cooking method. That may be the one reason, some of us stepping back in cooking fish at home. Fresh Mackerel / Ayala is the fish which I prefer for this curry. The tenderness of the flesh and its unique taste when curried makes me drool here. The taste of the curry depends on the freshness of the fish used. In a vessel (preferably clay pot) add chopped tomato, green chilly and tamarind pulp (soak in half a cup of water, press tightly with your hand and then extract its water discarding the seed ). Now grind together coconut, small onion, fennel seed / perumjeerakam, (turmeric, coriander and chilly )powders in half cup of water. Grind to a fine thick paste. Pour this into the vessel we set already along with required salt. Now switch on the flame and cook for about 8 minutes over a medium flame. The masala/spices must be cooked enough to get rid of a pungent spice flavor. So cook until the raw smell goes off. Stir occasionally. Then add hot water according to the consistency needed. Close the lid and cook for few minutes or until fish is done. It will take around 4 -5 minutes only. Do not allow to cook for long after adding fish as it will spoil the fish. Remove from flame. In a separate pan heat 2 tsp of oil and add 1 tsp sliced small onion/shallots. Saute well until golden and then add curry leaves. Switch off the flame. Pour it over the curry for seasoning and close the lid. Set aside for a while for the delicious taste and flavor. Serve hot along with steamed rice.Yummy.